The present Lebanese flag was adapted just prior to independence from France in 1943. 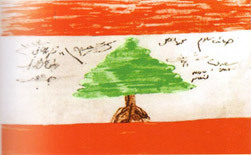 Seeking independence, the actual flag was first drawn by Member of Parliament Mr. Henri Pharaon and the deputies of the Lebanese parliament in Leader Saeb bey Salam's house in Mousaitbeh. It was adopted on December 7, 1943, during a meeting in the parliament, where the article 5 in the Lebanese constitution was modified. 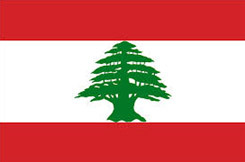 The Lebanese flag is formed of two horizontal red stripes enveloping a horizontal white stripe. The white stripe is to be two times a red. The cedar is in the middle section touches her red top and touch the base of the red section and the lower the size of Cedar parallel to the third the size of eggs section. Red symbolizes the blood of martyrs has been shed in the revolution of November 1943. White refer to white snow that accumulates on the mountains of Lebanon, a symbol of purity and peace, and the cedar tree that had been derived from Mount Lebanon, it stands to holiness and eternity and resilience of tradition. "The righteous flourish like the palm tree, and grow like a cedar in Lebanon"
For many years the Cedar of Lebanon has been the national emblem of Lebanon. The Cedar of Lebanon, Cedrus Libani, is an evergreen of the family Pinaceae. 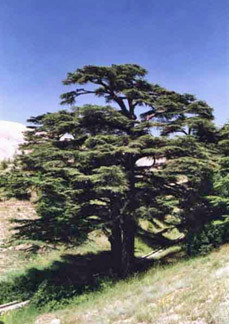 This coniferous plant was first found in Lebanon, on the Mount Lebanon range at Sannine, Barrouk, and the eastern and western mountain chains. The Mount Lebanon chain used to be almost completely covered with cedars. The importance of the cedar of Lebanon to the various civilizations is conveyed through its uses. The Egyptians used its resin to mummify their dead and thus called it the "life of death", and cedar sawdust was found in the tombs of the Pharaohs as well. Pharaohs and Pagans had the tradition of burning the cedar coming from Lebanon with their offerings and in their ceremonies. The superb qualities of the cedar wood as beautiful color, hardness, exquisite fragrance, resistance to insects humidity and temperature, incited Phoenicians, Egyptians, Greeks and many others to use it extensively. The Phoenicians built their trade ship and military fleets from cedar wood as well as the roofs of their temples, houses and doorsills. Kings of neighboring and distant countries asked for this wood to build their religious and civil constructs; the most famous of which are the temple of Jerusalem and David's and Solomon's Palaces. It was also used in the temples and furniture works of the Assyrians and Babylonians. Greeks, Latins and Romans had their share of Cedar wood which they praise and have pride in. "My love is as the cedars, beloved, and the elements shall not conquer it." 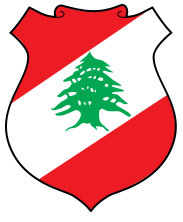 Khalil Gibran's, "A tear and a smile"
The coat of arms of Lebanon consists of a red shield with a white bend sinister on which is placed a cedar tree. It is very similar to the flag of Lebanon, with the exception of the Spanish fess on the flag being changed into a bend sinister. The Lebanese National Anthem was written by Rashid Nakhle and composed by Wadih Sabra. It was adopted on 12 July 1927, seven years after the proclamation of the state of Greater Lebanon during the French mandate. "All of us! For our Country, for our Flag and Glory! Our mountain and our valley, they bring forth stalwart men. The cedars are his pride, his immortality's symbol. All of us! For our Country"